My wife and I have worked quite hard to create a nice backyard habitat for birds and butterflies, and it is always fun to see it pay off. As an example, we've planted several plants in the milkweed family, including Pine-leaf Milkweed (Asclepias linaria) and Mexican Bloodflower (Asclepias curassavica), also known as Mexican Milkweed. With these plantings, our hope was to attract Monarch and Queen (Danaus gilippus) butterflies, and with some luck, maybe a Soldier. These plantings have proved to work quite well, with Queens seen daily in late summer, and occasionally most of the rest of the year. The one photographed below was looking for a place to roost for the night, and I noticed it settle on my Desert Hackberry (which is a fine butterfly plant in its own right). 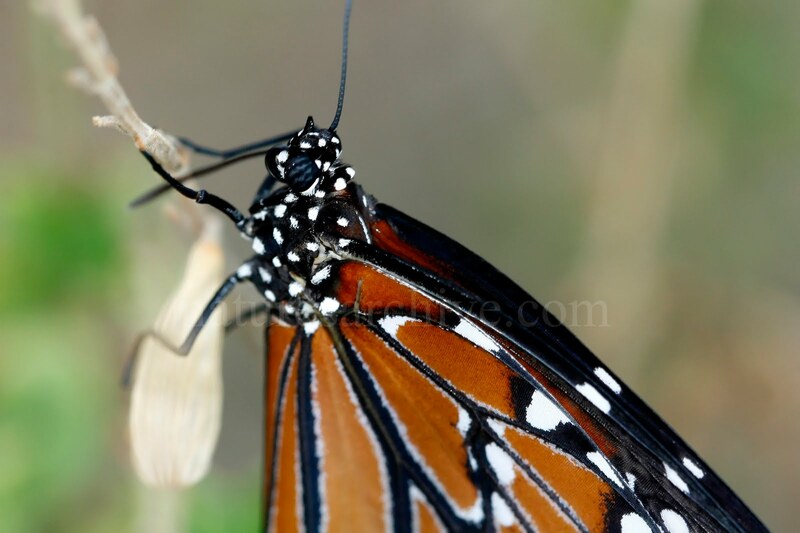 As mentioned above, Queens, Monarchs, and Soldiers are all considered Milkweed butterflies. 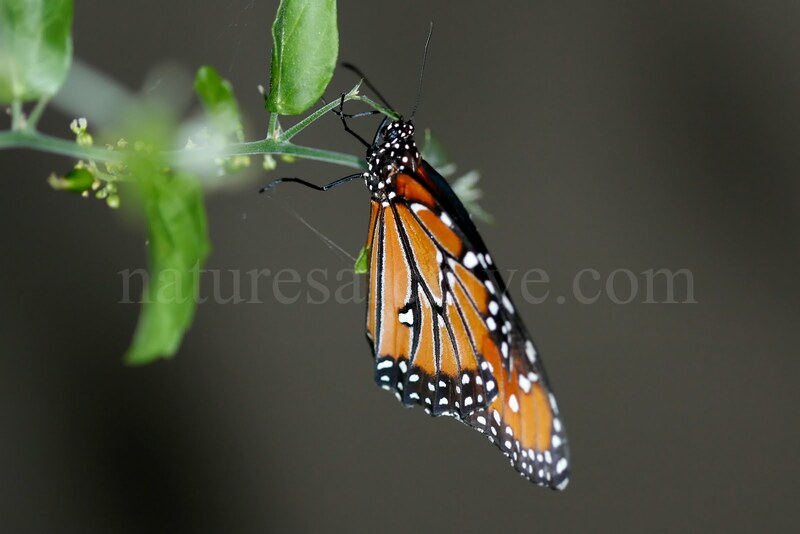 This is because these plants serve as their primary larval food source, and as such, these butterflies lay their eggs exclusively on milkweeds. It is thought that Milkweed butterflies have adapted to feed on milkweeds so that they can accumulate toxins, making them poisonous to potential predators. Two plants we're considering adding to the yard to help improve out attractiveness to Milkweed butterflies include Desert Milkweed (Asclepias subulata) and Mule-fat/Seepwillow (Baccharis salicifolia), which is known to be a favorite nectar source of Queens. And an additional update: the next morning I spotted another Queen apparently "warming up" for the day. It was attached to an Autumn Sage (Salvia greggi). I tried to take the opportunity to get a close-up photo of its head using my 100mm macro lens and ring flash. Even with the ring flash I had trouble getting a sharp photo over f6.3 (trying to get some better depth of field), but the following photo turned out OK.
Update: A few weeks later a number of Queen larva (caterpillars) were spotted, and along with some subsequent pupa. Great photographs! What do you use? I mentioned a bit about the equipment in the post. The camera body is a Canon XTi, and the lens for these was a 100mm f/2.8. I sometimes use a 300mm f/4 for butterflies and insects, too, and if necessary, add Kenko extenders to get closer focus. The Sigma Ring Flash is a real advantage for many close-up photos.